As most of my friends and readers of this blog know, I've become partial to SWTC yarns for my self and for designing. I was first introduced to Tofutsies when a call for toe-up knitters was put out on Ravelry. And with that, a wonderful friendship and collaboration was born. Jonelle has been a great inspiration for me as a designer. 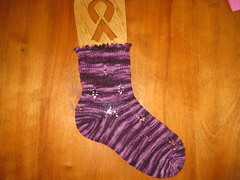 My second big feat came working with her and Kat on Socks A La Carte: Colorwork. If you have ever emailed SWTC for help, I am one of the voices that replies. I've found a new love. YarnZone now has a worsted weight yarn called Woolish. Single ply and squishy, like my Saphira. Shhh, I know I'm cheating. And it's ok, really. The colors are deep and rich. The yarn just begs to be snuggled and loved. The drape is beautiful. I really can't say enough about it. The jewel tones are just that. Luxurious through and through. 50g/100m. 1.76oz/109yd. $6.50 per ball. Have I said I'm in love? Going through YarnZone's website is dangerous. There are great deals on SWTC yarns, their own lines of yarns, and even things from the land down under. Melissa is a master at dying yarns, I have a couple of skeins she's done and the greens are amazing. I'm such a sucker for cool colors. I realize this may sound like a commercial, but I am a firm believer that when I find a yarn I let people know my opinions about it. I don't look down on yarn because of it's fiber content. When I make afghans, I use acrylic. I have a thriving mitten business where I work and I use an acrylic/wool blend. I know enough about non-crafters and what happens when those beautiful, expensive yarns are tossed into the washing machine. I even know knitters who have accidently done it. I firmly believe all fibers have a place in our crafting world. I also have strong feelings about how companies treat people. LYS's are slowly going away due to online sales; shameless plug here though. Pins and Needles in Farmington Maine. Lovely shop with wonderful owners. Stop in and tell her Caryn sent you. But I digress. So far ordering online the only problems I've had is the color not matching what is on the monitor. But we all seem to have that problem no matter where we order from. With all of that said, the service that I've been provided through YarnZone has been wonderful. In my series of patterns that are coming out this year, I will be using several of YarnZone's products mixed in with some of my old favorites from SWTC. And you can get both at amazing prices in one spot. March's pattern will feature Woolish and Syn. More to come on that as the date gets closer. As with Always in My Heart, I will be adding in a coupon code for YarnZone.